New York Rangers President and General Manager Glen Sather announced today that the club has acquired forward Jody Shelley from the San Jose Sharks in exchange for a conditional draft pick in the 2011 NHL Entry Draft. Since entering the NHL with Columbus in 2001, Jody Shelley has amassed 1,310 penalty minutes in 517 career games. 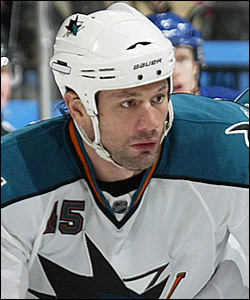 He led the NHL with 249 PIM in 2002-03 and holds San Jose's single-game record. Shelley, 34, has skated in 36 games for San Jose this season, tallying three assists and 78 penalty minutes. He ranks second on the team in penalty minutes, including a team-high 10 fighting majors. He logged 10:25 of icetime while skating in his 500th career NHL game on January 4 vs. Los Angeles. Shelley registered two assists, along with 11 penalty minutes and a plus-two rating in a four-game span from October 10 vs. Minnesota to October 19 against the Rangers at Madison Square Garden. He missed 23 games due to injury from November 10 to December 31. The 6-3, 230-pounder has registered 14 goals and 29 assists for 43 points, along with 1,310 penalty minutes in 517 career regular season contests with the Columbus Blue Jackets and San Jose Sharks. In 2002-03, he led the NHL in fighting majors (27), and ranked first in the league with a career-high 249 penalty minutes. He established a career-high in assists (seven) and points (10), and tied his career-high in goals (three) while leading Columbus and finishing fourth in the NHL with 163 penalty minutes during the 2005-06 season. Last season, Shelley led San Jose with 116 penalty minutes and 16 fighting majors, and registered two goals and two assists in 70 games. He made his NHL debut on February 17, 2001 vs. Pittsburgh, and recorded his first NHL point with a goal on December 15, 2001 at Los Angeles. In addition, Shelley has skated in seven career post-season contests with San Jose. The Thompson, Manitoba native was originally signed as a free agent by the Calgary Flames on September 1, 1998.